One-off Skype, Viber, WhatsApp or phone consultation, when you can discuss in a pace and time suitable for you all the relevant immigration issues. This service suits those who have various questions about their potential immigration case and wish to discuss the merits of that case, what application form to use, which supporting documents to enclose etc. The cost for this useful one-off consultation during the office hours is £75.00. You can also book a Saturday and Sunday consulation slot at a slightly higher rate. Click here to book your consultation slot now. 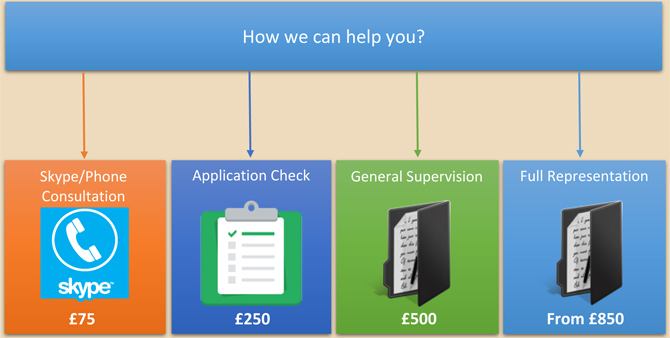 Immigration application pre-submission verification checks. This service suits those who intend to lodge their applications themselves but are in doubt about certain parts of their application or court bundle and want their bundle to be checked and verified by the experienced expert immigration lawyers advocates. We can check your application bundle and provide comments on the relevant issues. The fee for this briliant service is £250.00. Click here to order your Application Verification Service now. General immigration case supervision (de-facto representation). This service suits those who value their time, are unsure about their ability to prepare and submit a valid application or court bundle or whose application was previously refused but still wants to lodge the application themselves yet being under the supervision of a qualified immigration lawyer. You can appreciate the amount of administrative work including in the so-called full representation by a law firm, which is duly passed onto the client. By opting to lodge the case yourself yet being fully supervised by a qualified immigration lawyer you are likely to save significant amount of your money and yet be in full control of your immigration case, with full supervison and guidance from the specialist immigration lawyer. We will be checking, verifying, advising and supervising you on all the relevant steps in order for you to prepare and lodge your immigration application or court bundle in the best possible manner. The fee for this helpful service is £500.00. Click here to order your General Immigration Case Supervision (de-facto representation) service now. Full engagement and full case representation (de-jure). This service suits those who value their time, are unsure about their ability to prepare and submit a valid application or court bundle or whose application was previously refused. In most cases we can offer a fixed fee. We will be representing and advising you on all the relevant steps in order to prepare and lodge your immigration application or court bundle in the best possible manner. We will also be communicating with the Home Office, Immigration Service, Visa Application Centre, various courts (depending on the type of the application). Our fee for this professional service vary and the final fee depends on the difficulty of your case. Legal Centre is a professional law organization specializing in all UK Immigration issues. We strive to be different by having a particularly friendly culture and by being open and transparent in the way we work with you. We pride ourselves on being approachable and accessible and being able to explain information in a clear and honest way. Our website seeks to explain who we are and how we can help you – whatever needs you may have. We promise to make every effort to help you make your dreams come true. However, if we are unable to help you, we will tell you straightaway. Our work has changed many lives for the better. Our clients tell us that they appreciate our personal touch and the way we have handled often complex and sensitive matters. We specialize in difficult UK immigration law related cases, such as visa refusals, out-of-rules applications, asylum and immigration appeals, humanitarian and discretionary applications and bail. We also provide a wide range of Immigration, Business Migration, Education, Business services to individuals and businesses. As an organization we are enthusiastic and committed to Immigration Law. We aim to provide expert legal advice in a professional way every time. Our clients often comment not only on our responsiveness and our efficiency, but also on our friendly and personal approach to work. The information materials and opinions contained on this website are for general information purposes only and are not intended to constitute legal or other professional advice, and should not be relied on or treated as a substitute for specific advice relevant to particular circumstances. Neither Legal Centre nor any other entity associated with it accepts any responsibility for any loss which may arise from reliance on information or materials published on this website.